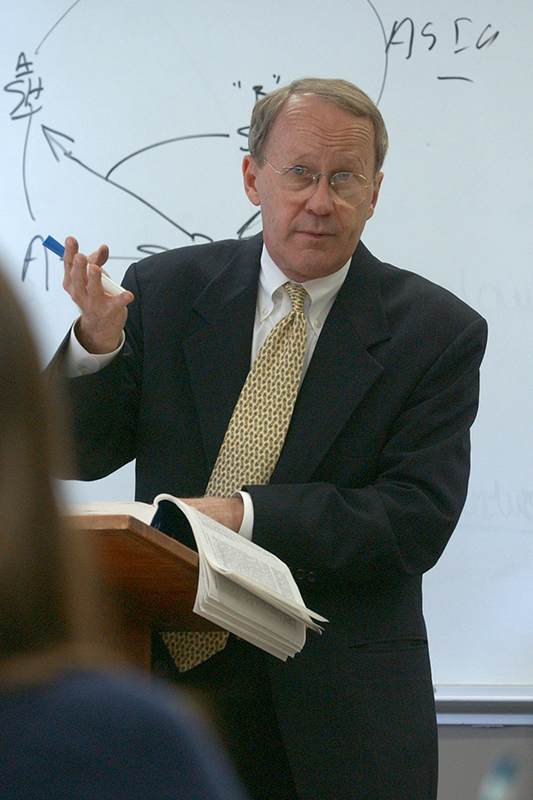 Rutheford B Campbell, Jr. is a Professor of Law who has returned to full-time teaching following service from 1988 to 1993 as Dean of the College of Law. He is a graduate of Centre College and a Coif graduate of the College of Law where he served on the Kentucky Law Journal. In 1971, he received an LL.M. from Harvard Law School. Upon leaving Harvard he began teaching law at the University of South Carolina, which he left in 1973 to return to the College as a law teacher. Professor Campbell has practiced law as an associate at White & Case in New York City and as a partner with Stoll, Keenon & Park in Lexington. Professor Campbell writes and teaches in the securities, economics and corporate law fields and has published numerous works, including articles in the Duke Law Journal, the North Carolina Law Review, and the Washington University Law Quarterly. The Case for Federal Pre-Emption of State Blue Sky Laws, in Prosperity Unleashed: Smarter Financial Regulation (Norbert J. Michael ed., 2017). The New Business Corporation Act: The Basics (Office of Continuing Legal Education at the University of Kentucky College of Law ed., 1988) (with David W. Harper, Stephen B. Catron & Keith G Hanley). 7th Annual Seminar on Securities Law (Office of Continuing Legal Education at the University of Kentucky College of Law ed., 1988) (with H. Alexander Campbell, Ivan M. Diamond, Fredrich H. Thomforde, Frederic H. Davis, Cynthia W. Young, C. Craig Bradley, Jr.). Seminar on Securities Law (Office of Continuing Legal Education at the University of Kentucky College of Law ed., 1986) (with James A. Kegley, H. Alexander Campbell, Gary L. Stage, Ralston W. Steenrod, James C. Strode, Robert P. Ross & Gerald R. Martin). Rutheford B Campbell, Jr.'s scholarship can be downloaded from his SelectedWorks page. The Role of Blue Sky Laws After NSMIA and the JOBS Act, 66 Duke L.J. 605 (2016). The SEC's Regulation A+: Small Business Goes under the Bus Again, 104 Ky. L.J. 325 (2016). The New Regulation of Small Business Capital Formation: The Impact—If Any—Of the JOBS Act, 102 Ky. L.J. 815 (2014). The Wreck of Regulation D: The Unintended (and Bad) Outcomes for the SEC’s Crown Jewel Exemptions, 7 Ohio St. Entrepreneurial Bus. L.J. 287 (2012). Regulation A and the JOBS Act: A Failure to Resuscitate, 7 Ohio St. Entrepreneurial Bus. L.J. 317 (2012). Normative Justifications for Lax (or No) Corporate Fiduciary Duties: A Tale of Problematic Principles, Imagined Facts and Inefficient Outcomes, 99 Ky. L.J. 231 (2010-2011). The “New” Fiduciary Standards Under the Revised Uniform Liability Company Act: More Bottom Bumping from NCCUSL, 61 Me. L. Rev. 27 (2009). Resales of Securities: The New Rules and the New Approach of the SEC, 37 Sec. Reg. L. Rev. 317 (2009). Bumping Along the Bottom: Abandoned Principles and Failed Fiduciary Standards in Uniform Partnership and LLC Statutes, 96 Ky. L. J. 163 (2007-2008). Managers’ Fiduciary Duties in Financially Distressed Corporations: Chaos in Delaware (and Elsewhere), 32 J. Corp. L. 491 (2007) (with Christopher Frost). Regulation A: Small Businesses’ Search for “A Moderate Capital”, 31 Del. J. Corp. L. 77 (2006). Kentucky Corporate Fiduciary Duties, 93 Ky. L.J. 551 (2005). The Ethical Obligation of Transactional Lawyer to Act as Gatekeepers, 56 Rutgers L. Rev. 9 (2003) (with Eugene R. Gaetke). The Impact of Modern Finance Theory in Acquisition Cases, 53 Syracuse L. Rev. 1 (2003). The Overwhelming Case for Elimination of the Integration Doctrine Under the Securities Act of 1933, 89 Ky. L.J. 289 (2001). The Insidious Remnants of State Rules Respecting Capital Formation, 78 Wash. U. L. Q. 407 (2000). Fair Value and Fair Price in Corporate Acquisitions, 78 N.C. L. Rev. 101 (1999). The Impact of NSMIA on Small Issuers, 53 Bus. Law. 575 (1998). Blue Sky Laws and the Recent Congressional Preemption Failure, 22 J. Corp. L. 175 (1997). Corporate Fiduciary Principles for the Post-Contractarian Era, 23 Fla. St. L. Rev. 561 (1996). A Positive Analysis of the Common Law of Corporate Fiduciary Duties, 84 Ky. L.J. 455 (1996). Resales of Securities Under the Securities Act of 1933, 52 Wash. & Lee L. Rev. 1333 (1995). Rule 145: Mergers, Acquisitions and Recapitalizations Under the Securities Act of 1933, 56 Fordham L. Rev. 277 (1987). Racing Syndicates as Securities, 74 Ky. L.J. 691 (1986). An Open Attack on the Nonsense of Blue Sky Regulation, 10 J. Corp. L. 553 (1985). The Plight of Small Issuers (and Others) Under Regulation D: Those Nagging Problems that Need Attention, 74 Ky. L.J. 127 (1985). Stallion Syndicates as Securities, 70 Ky. L.J. 1131 (1982). Voluntary Recapitalization, Fairness, and Rule 10b-5: Life Along the Trail of Santa Fe, 66 Ky. L.J. 267 (1978). Santa Fe Industries, Inc. v. Green: An Analysis Two Years Later, 30 Me. L. Rev. 187 (1978). The Plight of Small Issuers Under the Securities Act of 1933: Practical Foreclosure from the Capital Market, 1977 Duke L.J. 1139 (1977). Definition of Control in Secondary Distributions, 18 B.C. Indus. & Comm. L. Rev. 37 (1976). Limited Liability for Corporate Shareholders: Myth or Matter-of-Fact, 63 Ky. L.J. 23 (1975). Kentucky Law Survey, Criminal Procedure, 64 Ky. L.J. 325 (1975). Kentucky Law Survey, Criminal Procedure, 63 Ky. L.J. 701 (1975). Elements of Recovery Under Rule 10b 5: Scienter, Reliance, and Plaintiff's Reasonable Conduct Requirement, 26 S. C. L. Rev. 653 (1975). Sentencing: The Use of Psychiatric Information and Presentence Reports, 60 Ky. L.J. 285 (1972). Rutheford B Campbell, Jr., The Case for Federal Preemption of State Blue Sky Laws, The CLS Blue Sky Blog (May 18, 2017), http://clsbluesky.law.columbia.edu/2017/05/18/the-case-for-federal-preemption-of-state-blue-sky-laws/. From March to June, six UK College of Law faculty members took part in UK College of Law Continuing Legal Education programs by presenting in their areas of expertise.